Should I buy a walker for my little one? What makes a good baby walker? As soon as your little bundle of joy comes home you start shopping for the little essentials. From nappies to creams, you ensure that everything is nothing but the best. Baby’s first steps are a developmental milestone and as much as you are excited to take those little feet forward, you also worry about safety and accuracy. A baby walker is one of the first rides that your baby takes and the decision is often a tough one. With a multitude of options available in the market and overflowing baby walker opinions you are left confused with the abundance of choice. Here we make the decision of the ideal baby walker easier for you with a comprehensive analysis of top walker products and answers to all questions that may be troubling you. Read on to know more about the best baby walker for carpet. 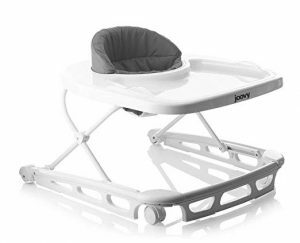 This latest version of infant walker from Joovy aims to combine two products in one. It is aimed to be a high chair as well as walker so eating, playing as well as walking training are accomplished with one product. It is a practical design that looks good and adds charm to your space without cluttering it. It comes with a tray and a removable insert for meal times. The insert can be wipes as well as put in the dishwasher to make it convenient for you. The extra large tray also makes for a good play companion with room for baby toys. It comes in a bright white color with a glossy finish. This infant walker promises to ensure strength, safety and stability because the base is adequately wide. The wide base also ensures that the toddler doesn’t hurt fingers as the walker bangs into the wall. For comfort, the brand combines a supportive and cozy seat pad that is machine washable and sturdy. The back is soft and padded to make for the perfect meal companion. 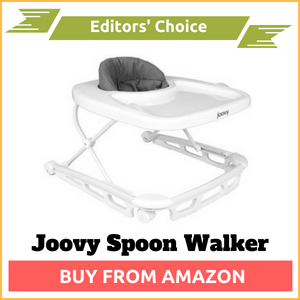 This infant walker is a pretty good companion for your baby. It is very sturdy and high quality and thus safe for the baby. But, if you are concerned about the baby walker price, it maybe quite expensive. It may save space by combining two products but the tray may be too large for small spaces. It is a perfect choice for smaller babies but the limited height adjustment may prove to be unworthy for taller munchkins. 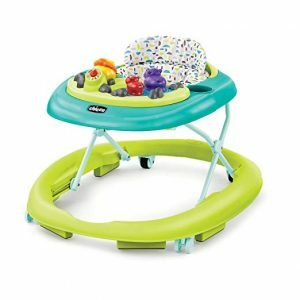 The Roaming Safari Walk-A-Bout from Bright Starts is a jungle themed baby walker that holds fun at the crux of its concept. 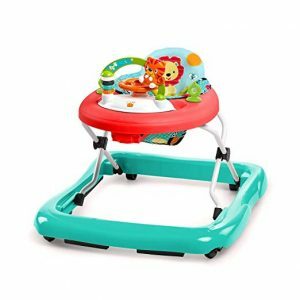 It is a super fun baby walker that offers opportunities for unlimited fun with its removable toy tray that comprises of stimulation as well as development activities and toys. 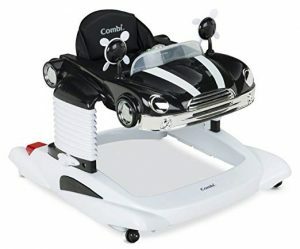 It comes with an attractive steering wheel that functions to activate lights, music and sounds to keep the baby entertained. It also features a high seat back support and 3 height positions, so there is just one walker till the baby grows. It offers ample opportunity to stretch and glide to the baby. Seat is extremely comfortable and supportive with its high back. Soothing music with volume controls. If you are looking for a budget walker, this is a good and sturdy choice but lacks the overall entertainment for the kid. If you are interested only in the walker it is good but doesn’t work well as an activity center. Doesn’t work very well on carpeted floors but worth a try if you are looking for a product for hard floors. The chicco walky talky is your best bet if you want to keep the baby engaged, help them learn and enjoy. It is a multi-lingual walker that offers much more for entertainment than just the alphabets. It recites sayings in multiple languages including English, Spanish, French, Italian, German and Portuguese. The one of its kind baby walker features a multilingual play tray that is removable and can be turned on or off. It can be used as a standalone toy too. It features entertaining tunes for the baby to enjoy and colorful lights too. Easy to fold and compact, it is easy to transport or store away. It comes with 3 height adjustments, so it grows with your baby. The seat can be removed and washed. It ensures extra comfort for the tender baby bottom with a padded seat. It includes brake pad to bring the walker to a halt if it reaches stairs. It is overall an amazing product without any major flaws. If the low volume doesn’t bother you, it is the right choice of baby walker that works perfectly and also offers a multi-lingual play interface. The Combi Ferrari F1 Activity Baby Walker aims to be an all-in-one companion for your child with its attractive looks and versatile activity center. The child cam stand, jump, bounce and explore all with lots of fun. It is indeed the first ride on that will keep the kid engaged with wide range of options. 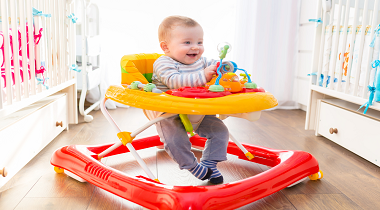 Loaded with a multitude of fun options such as mirrors, lights, sounds, the baby walker makes sure that the baby stays engaged as you complete your chores around the house. And what’s more, it can also work as a large tray for snacks and drinks if the car hood is removed. Complete cognitive development and fine motor skills training for the child with a fun and mobile walker that is also an amazing activity center. The look and feel of a gorgeous race car. Easy to assemble as soon as it is out of the box. Machine washable paddings and rollings. Comfortable and padded seat that is easy to take off and wash in the machine. This is overall an amazing product when it comes to look and appeal. The build is sturdy and durable. It is definitely going to keep the baby entertained as you run around completing chores. However, it is a fail if you are looking for a carpet product, for hard wood floors it is the perfect choice. The transition from baby steps to the big leaps is made easier with the Sit-to-Stand Learning WalkerTM by Vtech that focuses completely on providing an adaptive technology that helps the crawler be an effortless walker. It offers opportunities for never ending fun as your little one learns to walk. Speed controls on the wheels that can be adjusted based on age of baby and type of floor. Removable play panel for toddlers that can go on the ground as well as ensures fun on the run. It is also perfect for developing fine motor skills in the baby. Numerous sing along songs and music options so toddlers never get bored. It is overall a good product that eliminates the hazards of a sit in walker and still keeps the baby engaged for a long time. It is perfect for carpeted floors but may be a little slippery for hard ones. It is the perfect choice of activity center and walker in one if you are not too worried about over stimulation with lights and music. Go for it if you are looking for some time to finish the household chores as the baby stays engaged. As the little munchkin grows up and gains a sense of independence, he will certainly want to indulge in self transportation. Walkers are the best way to help them discover their feet and motor skills as they maneuver around the house. 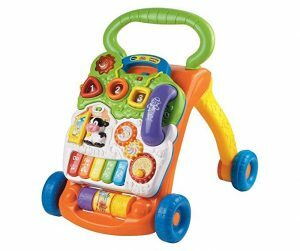 Activity walkers come in attractive colors and clad with activity toys so the baby stays entertained as you complete your household chores around the house. Baby walkers promise to make the baby learn to walk earlier, i.e speed up the walking milestones. The probability of accidents is a little high with baby walkers as they allow the baby to move at high speeds and at that pace the caregivers do not get adequate time to intervene in case of a mishap. It offers them an elevation and hence babies can easily access things on tables and countertops that can be potential hazards for them. Walkers do not give the much-required floor time to the baby that is necessary for muscle development. Some models may put undue pressure on the wrong muscles. Baby walkers are pretty dangerous in places where there are stairs or swimming pools and must be avoided. The safety and specifications of walkers around the world are a topic of speculation and people are divided in their opinions about walkers. While some people advocate the use, some are absolutely against it. Whether you can ensure a safe environment for the baby to navigate around in a walker. You must avoid if you cannot block access to staircases or pools. You may put the baby in the walker but must look over for any potential hazards such as pulling of sharp and heavy objects etc. You must also regulate the time you put the baby in, the baby must not go in endlessly. The walker you choose must be from a reputed manufacturer and must meet the safety criterion. Cheap baby walkers on the shelves always pose the risk of tipping over or injury. If keeping the baby engaged is your only goal and you cannot keep them supervised, it is better to invest in activity centers than walkers. 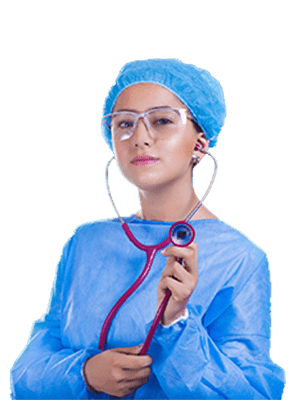 On the contrary, walkers are a good choice if you can take precautions and carefully pick the ideal walker. The walker must be lightweight and easy to use. Look for a sturdy design that minimizes the risk of tipping over. The size of the equipment must be appropriate. A design that is neither too large nor too small is ideal to avoid injury and harm. While peppy and colorful designs are good to keep the baby entertained, they should not be overloaded with toys to avoid overstimulation. The wheels should be bare and easy to rotate. Jamming of wheels may increase the risk of injury. If choosing a sit in walker, make sure that the lower ring has a larger diameter. This helps to prevent the baby from reaching harmful objects. While most manufacturers recommend the ideal age for using baby walkers and baby push walkers as infants to toddlers i.e 4 to 16 months, it varies on the development of individual babies. Since, all babies are different a common slab may be a little misleading. Developmentally, the baby must at least be able to hold the head up steadily and touch the feet on ground. Some professionals also recommend waiting for the sitting and crawling milestone. That indeed is the safest indicator of readiness for a walker. If you are looking for baby walker online and are confused with the overwhelming volume of options, we have made it simple for you. Q: What is the right age for a baby walker? The ideal age for a baby walker as prescribed by manufacturers is 4-16 months but it greatly depends on the signs of readiness shown by your baby. Q: Can the baby be put in walker all day? No, A walker is also a toy and nothing can replace adequate time on the floor without any walking aids. Q: Where are baby walkers banned? Baby walkers are completely banned in Canada. Q: Where to buy baby walker? Baby walkers can be bought online or from stores but adequate research needs to go in to product safety and suitability. Q: What baby walker should I buy? There are numerous brands of walkers available. One must keep in mind all the specifications and pros and cons of walkers in order to make a wise choice. The choice should not be solely based on baby walker price. Q: What baby walker works on carpet? There are many manufacturers that offer walkers for carpet. They include Vtech, Chicco, Joovy etc. Q: What baby walker is the best? The best baby walker eliminates the risk of injury and is sturdy and smooth to maneuver. There are different options available for different needs based on the type of floor, space etc. Q: How do baby walkers delay walking? Experts around the world are arguing on this aspect. Some believe that baby walkers put pressure on the wrong muscles in the legs and delay walking. They also think that it causes the baby to be dependent on the walker and thus not interested in walking without it. Q: How are baby walkers dangerous? Baby walkers can pose a major risk if the area you live in has stairs or a pool. They may cause accidents and injury. They also offer elevation to the baby to reach dangerous objects on counter-tops. If not well designed, they may cause injury to baby fingers in case of banging against the wall. Q: How are baby walkers bad? This varies based on person and household. Baby walkers may prove to be dangerous if the child is left in it unsupervised and the space is not optimized for walker use. The added speed by the walker wheels may make it difficult for the caregiver to reach out with help in time. Q: How to adjust baby walker height? Height adjustments in baby walkers vary per manufacturer. Some come with adjustment option and some don’t. For most walkers that allow adjustments you need to rotate the safety lever lengthwise and press till the mechanism releases. Q: How to fold baby walker ? Folding a baby walker also varies based on brand. You need to follow manufacturer instructions to fold the walker. Q: How to lower baby walker? Follow the height adjustment instructions by the manufacturer to lower the baby walker. For most brands, rotate the safety level and press it till the mechanism releases. Q: How safe is baby walker? Just like all other baby gear with wheels, the baby walker may not be the safest gear but if you keep the baby under supervision the hazards can be reduced and probability of mishaps eliminated. Q: Does baby walker work on carpet? Yes, baby walkers work on carpet. In-fact, many are designed specifically for carpets. Q: Does baby walker hinder development? There hasn’t bee a conclusive study that establishes the link between baby walkers and delayed development but several healthcare professionals are of the opinion that its puts pressure on the wrong muscles. It, however has no evidence to it. Q: When will baby use walker? It depends on the personal development of the baby. Most manufacturers state it ideal for 4-16 months. Q: Are baby walkers bad for hips? There hasn’t been any proven evidence of baby walkers causing hip dysplasia but many studies do suspect an association between them. Q: Can baby walkers cause bow legs? Yes, if the baby is left in the walker for too long, it may cause hip dysplasia. Q: Can I bring a baby walker to the plane? Yes, but the walker needs to be checked in with the main luggage, you cannot carry it with you as hand luggage.